You can probably tell just by the name that this guy comes from the '80s. A threat to justice, Nuke is a dangerous and radical patriot with Super Soldier strength and speed. Nuke was created by Frank Miller and David Mazzucchelli for Daredevil #232, part of the seminal "Born Again" storyline. Frank Simpson was a Vietnam vet who was subjected to Project Homegrown, experiments meant to create a viable replacement for Captain America. He has cybernetic bones, bulletproof plastic skin, and a second heart that's powered by the red, white and blue pills he takes: red to amp up his adrenaline, blue to calm him down, and white to keep him balanced between missions. He's also a traumatized paranoid schizophrenic who is subject to the whims of his handlers. 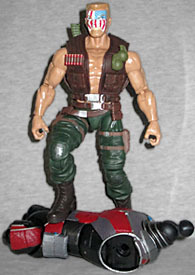 Nuke is built on the Marvel Legends "big" body, but he gets a surprising amount of new pieces. I mean, come on: this is Nuke, people, not an important character. And yet he gets an entirely new lower body (pants and boots), a new belt, and a new vest that are all unique to him? What a world! The brown boots have sculpted stitches and laces, the green pants have metallic grey pads on the knees and brown pouches straped to the thighs. 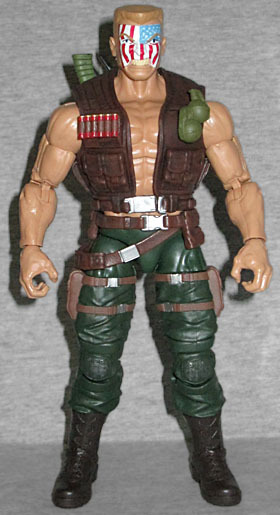 His vest has even more pockets, of course, as well as shotgun shells and a pair of grenades sculpted to the chest. It's held together at the buckle in the front, in case you want to remove it for a more classic appearance. 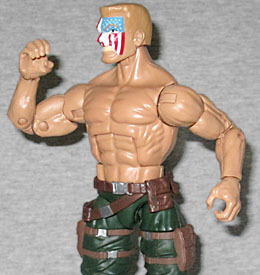 Nuke's defining visual trait is that he's got an American flag tattooed on his face, something this figure duplicates nicely. He has a blonde flattop and a major snarl on his lips. His eyes seem set a little too far apart, but the facepaint helps hide it. In the tradition of many recent Legends, he also comes with an alternate head: it's still got the flag, but it's bald, and the skin is split away to reveal the metal skull beneath. This happened during a fight with Wolverine, and while it's not a very famous look, it is sculpted really nicely. The figure's articulation is the same as other uses of this body - no surprise. The arms on the big body already had enough trouble coming straight down, though, and the new vest just exacerbates that. Since the belt is soft and flexible, it doesn't block the right leg at all, despite hanging down below the hip. 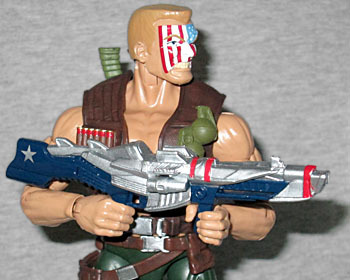 In addition to the weapons molded on his vest, he's also got the AIM Scientist's gun, painted a thematically appropriate red, silver and blue, with a star on the stock, as well as a repainted version of the knife Warpath carried. 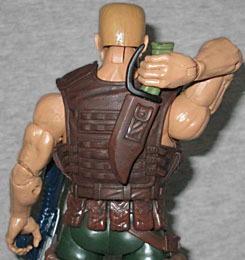 There's a sheath on the back of his vest specifically for the knife, and he's articulated enough to reach over his shoulder and grab it. Unfortunately, his hands are open slightly too wide to hold the gun very well. We get a Build-A-Figure piece, of course. The BAF is Giant-Man, and Nuke gets the entire trunk. It's a nice sculpt, and will look even nicer once it's got some limbs plugged into it. 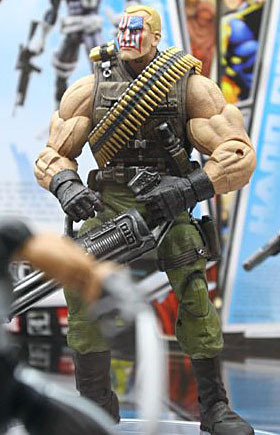 Nuke almost got a Marvel Legend once before - he was one of the figures in that 2009 concept case vote, and would have been a repaint of Crossbones. He's still an unlikely choice for a figure, so you have to wonder whether his appearance on the first season of Jessica Jones helped him become plastic. Either way, this toy does a nice job of capturing the comic character.